The hopes of many Inuit were raised by the the creation of Nunavut — Canada’s newest (and Inuit-majority) territory — in 1999. Nunavut also gave me an opportunity to sit still for a while. 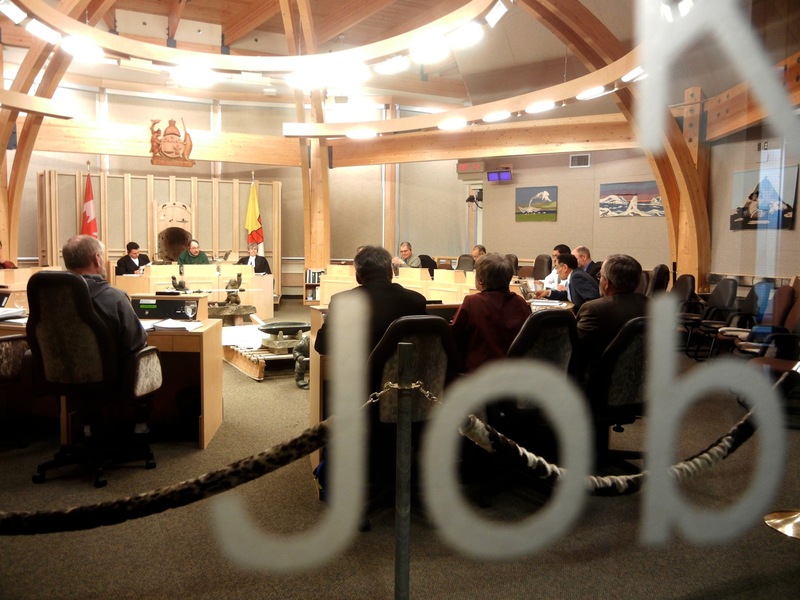 With its moments of drama and boredom, the Nunavut legislature’s sittings unfolded like a slow-moving television show, and the “ledge” became a cozy place to pass the hours. The legislative chamber’s shape was reminiscent of an igloo, the chairs and gallery benches covered in sealskin. 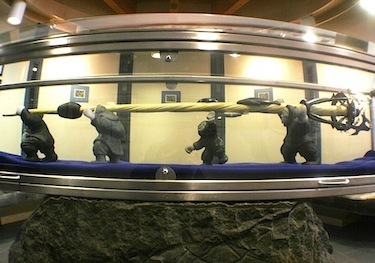 Pangnirtung tapestries and Baker Lake wall hangings decorated its walls, and the legislative mace was a long narwhal tusk. When in session, the legislature’s schedule ran with a calming regularity, unlike the flow of news. The day’s session always began on time. There were the predictable orders of the day: statements, questions and tabled documents. I sat in the gallery behind the health minister. It was my favourite spot because I could see everyone— and nestle there for hours. The antics of the rookie MLAs provided me with much entertainment. 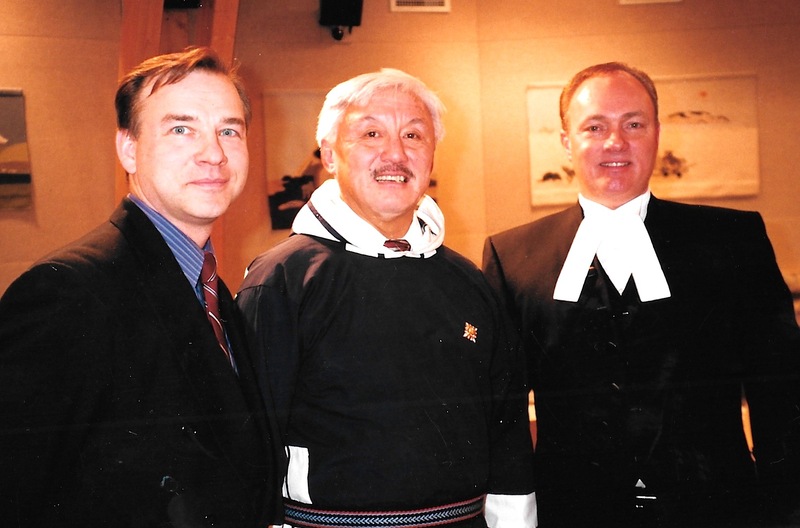 During a memorable afternoon in November 1999, there was the last-minute walkout of members David Iqaqrialu, Jobie Nutaraq and Enoki Irqittuq, just before the final vote on Bill 3, which was to give formal assent to Nunavut’s short-lived unified time zone. Nunavut’s decentralized administration stretched across three time zones, making communication difficult for government officials whose days began and ended at different times, depending on where they lived. So to some people, putting Nunavut into one time zone looked like a great idea. The idea was especially popular in Nunavut’s western Kitikmeot region, where the work day lagged two hours behind that of Iqaluit, the capital. But in the east, many residents complained that in the winter, darkness would come too early under their re-adjusted time zone. As the MLAs against the single-time zone sulked outside, other members scurried to form a quorum. But even this tension is short-lived. The members finally came back to vote against the bill’s adoption. But they learned the Government of Nunavut had already adopted a regulation putting the time zone change into effect. The members voiced their discontent in a scene that reminded me of television courtroom programs because they sounded stilted and scripted. Premier Paul Okalik then said the move to put Nunavut into a single time zone — which was later repealed — hadn’t been done behind their backs. During more boring moments in the legislature, some ministers read newspapers or pass notes to each other, and, at other times, they yawned. If nothing interesting was happening, I looked at what the legislators are wearing. The Premier often wore a plush sealskin vest. On some days, up to six of the 19 members followed his fashion lead, turning up in sealskin vests, sometimes with designs or even dyed in variety of colours. The choice of what members decided to wear, however, wasn’t entirely about comfort or good looks — they said it was also a way of showcasing Nunavut’s sealskin industry. Some sported colourful blue ties with Nunavut’s distinctive polar bear logo or ties featuring animals from geese to bears. The occasional tie was made from sealskin. Instead of a tie, one MLA preferred to wear a string bolo topped with an ivory drum dancer. 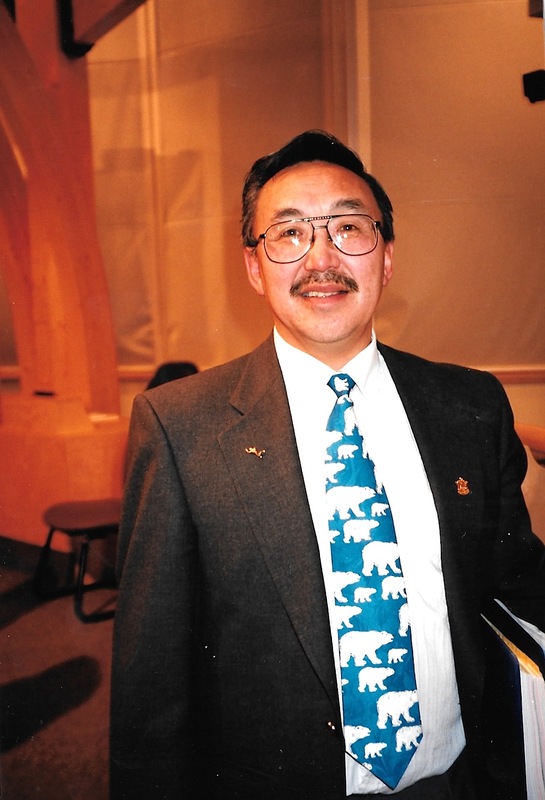 Although Kugluktuk MLA Donald Havioyak said he didn’t like ties “because they remind me of residential school” — where he was obliged to wear one — Havioyak wore one anyway —and picked cheerful designs for his ties. 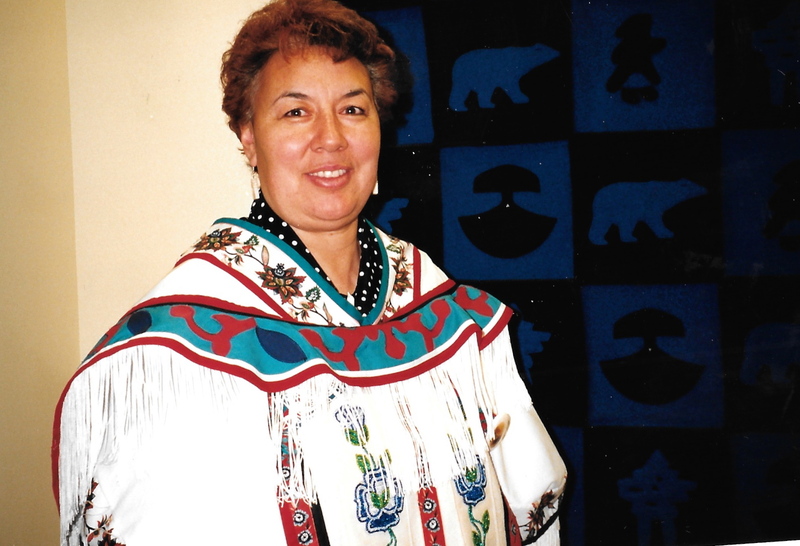 “If you’re well-dressed, you’re respecting the people you represent,” said Nunavut’s sole woman member and minister of public works, Manitok Thompson. Thompson’s outfits alternated between professional suits and a selection of three traditional amautiit, decorated with beads. “I wear them on special occasions — or if something stressful is going on,” Thompson said. Others in the chamber wore sealskin or caribou kamik boots, sometimes in combination with silapaq parkas. Occasionally sealskin boots also showed up along with suits. Some always stuck to conventional southern-style suits, because they said they were more comfortable. White dress shirts, however, were not seen as often because, as one member confided, these were particularly hard to find at Iqaluit’s poorly-stocked retail stores. As a result, members were even known to borrow white shirts from each other to wear on special occasions. Colonial apparel from an earlier era was also displayed by the stiff traditional black and white robes worn by the speaker and his staff. 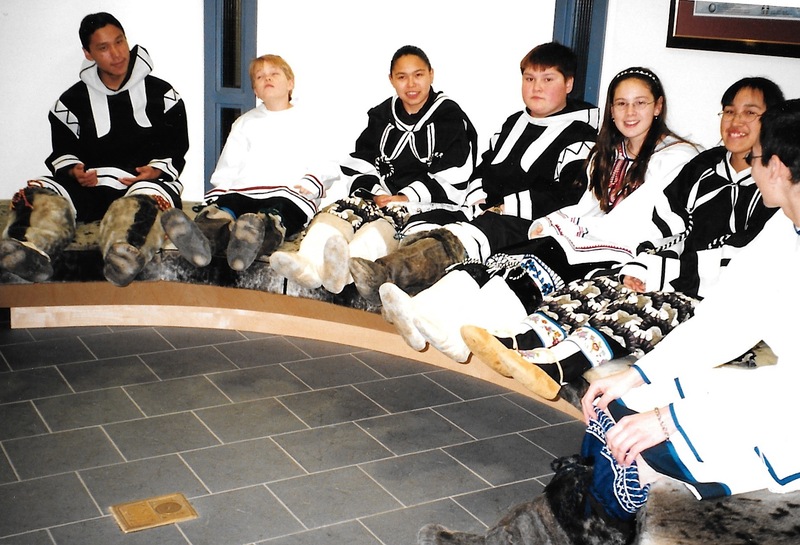 Pages, usually found outside the ledge in the teenage uniform of jeans and t-shirts, wore a variety of different traditional Inuit clothing from each of Nunavut’s three regions. 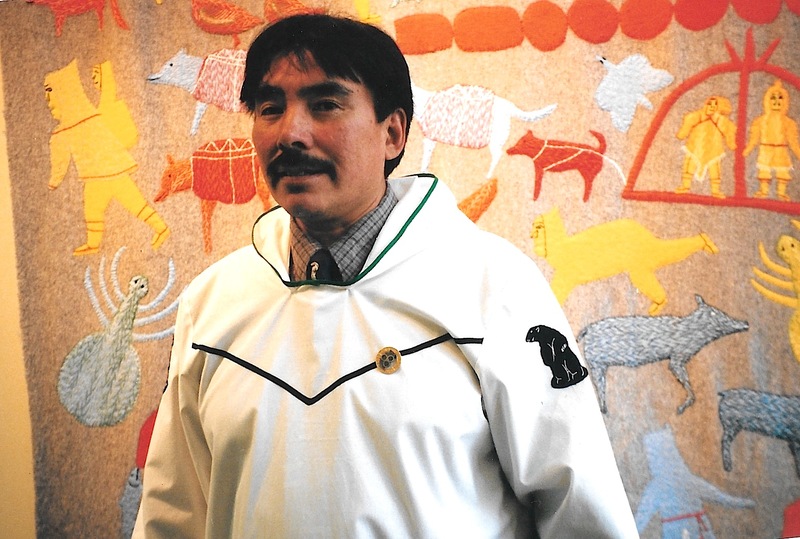 The clothing was designed to combine Inuit Qaujimajatuqaangit, that is, Inuit language and traditions, with Canada’s parliamentary system of government. And diversity was mirrored not just in what people wore, but also in the many languages spoken in the legislature. Nunavut’s Speaker should choose between five different ways to say “thank you,” from nakormik to koana, while business was often conducted in several dialects of Inuktitut as well as in French and English, Canada’s two official languages. But even this legislature was not immune to the social problems outside. The first speaker, as well as the education minister, were both charged with serious criminal offences — sexual assaults — within months of the new territory’s creation. But at least this new government wanted to focus on solutions and put these solutions into bite-size pieces that I could handle. As I left the legislature, I stopped and looked at the art exhibits in the foyer, or chatted with friends, before zipping up my parka and heading out to the windy streets of Iqaluit. Like an iceberg wraps up June 2.